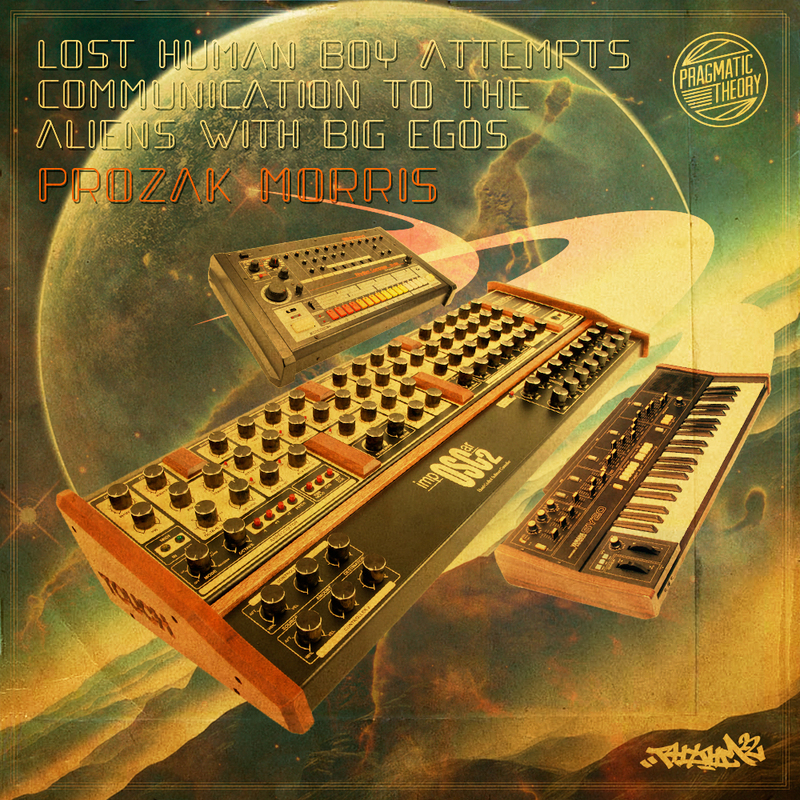 We’re extremely proud to present to you “Prozak Morris – Lost Human Boy Attempts Communication To The Aliens With Big Egos”. The unique talent that is Prozak Morris has been part of the Pragmatic Theory family since day one. After walking out of his Interscope Record deal, Prozak is now ready to unleash the beast on the music World once again without constraint. We’re blessed that Prozak chose to have his comeback on Pragmatic Theory & as is his wish, any profit made from the release will go towards future Pragmatic Theory physical releases. The album can still be downloaded completely free by entering ‘0’. We hope you enjoy the ride…. “Lost Human Boy Attempts Communication To The Aliens With Big Egos” is Part2 of “Lost Alien Boy Attempts Communication To The Creatures With Big Feet” from 2012… (prozakmorris.bandcamp.com/album/lost-alien-boy-attempts-communication-to-the-creatures-with-big-feet-lp) The story begins a few years after Prozak Morris and Chikies The Dog were forced to say goodbye to their Alien visitor PZMsW51986 at the end of Part 1. Prozak received a sonic transmission out of nowhere sent from his distant friend one night while making a beat; the transmission was an SOS cry for help. After PZMsW51986 returning to outer space on his species mother ship he and his father found themselves witnessing the effects of evil queen Recordicon Dealia running rampant throughout the galaxy. Her reign of terror was causing a suffocation of creative atmospheres through tactics of mind control, social status manipulation, and the evil poisonous spell of narcissism she would inject into a creative planets core with a tool of destruction she used called the Interpolarity-Scope. When Proz and Chikies The Dog received the news they immediately boarded there space cruiser “The One Man One Dog Enterprise” and set sail on there most epic mission into space as of yet. About 17 galaxies outside of the familiar Solar system of planet earth the presence of Prozak and Chikies was detected by Recordicon space traffic controllers but was swiftly jammed by Chikies The Dogs ability to be a spectacular astronaut. After infiltrating the evil armies dematerialization sequence system Proz and Chikies were able to beam two of Dealias evil solders onto The One Man One Dog Enterprise. The solders were soon hypnotized with a bonic sonic truth serum to locate the whereabouts of the evil queen in hopes to put an end to her destruction on the creative solar systems of outer space. They learned the evil queen had set a coarse for the Multiple Infrasonic Dimensional Infrastructure otherwise knows as the MIDI galaxy. Her intent was to infect the new planet the PZMsW race were in the midst of rebuilding after she had destroyed there previous planet some light-years ago. It was on, it was so on. Upon arriving to the evolving planets first series of energy rings that boarder its core sphere Prozak and Chikies were greeted by a sonic transmission sent by the father entity of their beloved alien brother PZMsW51986. The message contained the most devastating news the two space travelers were in no way prepared to hear. They were racing through space to get to the MIDI galaxy before the evil queen, but they were not fast enough. Her arrival to their new planet in construction quickly escalated into a war of creative energy vs. the destructive forces of greed. As she pointed her treacherous tool the Interpolarity-Scope at the planet a surge of what appeared to be green lightning began to generate and circulate the evil weapon. Moments before the beam of evil energy was discharged from her weapon PZMsW51986 boarded a small cruiser space pod and sped forth right into the enormous linear barrel of Dealias evil ray. Before the Scope could send its decimating blast to the PZMsWs planet 51986s space pod jammed the weapon causing the charge to implode within it causing an epic explosion the PZMsW’s hadn’t seen the likes of since there original planet was demolished some years ago. As the debris of the blast settled it was evident that Evil Queen Recordicon Dealia was at long last no more…but in a tragic turn of events the discovery was soon made that so was PZMsW51986. He sacrificed his physical existence to save what was left of his species, and home they were devoting there lives to re building. Hearing this awful news immediately caused Prozak and Chikies to fall to there knees and weep at the thought of there dear brother giving up his own life to seize the horror of evil queen Recordicon Dealia. PZMsW51986’s father began to console the two crushed space travelers by communicating with Prozak in the indenticle sonic modulated sounds his son used to communicate to him with during there adventures on earth a few years ago. The familiar sound was printed in Prozaks human mind as 51986’s voice and he was quickly comforted by those strange and missed tones. His father began to explain to Prozak how much 51986 used to talk about what he learned on planet Earth every day to all the other PZMsW’s. He would talk about his earthling friends Prozak Morris , Chikies The Dog, and Zareth he had to leave whom he dearly missed, and his love Synthia whom he wrote new sonic sequences known to humans as “music” for every single day. He would wonder for hours if his earthling brother Prozak was staying true to the message he had been sent to earth to share with him…and in result all humans. As Prozak listened to these things he began to look within himself and realized he had been failing his long lost alien brother and he had been failing all of the PZMsW species. He himself had fallen guilty of the very things Recordicon Dealia was using in extremes to wipe out entire planets and solar systems. He as of the last few years had grown weary of fighting so hard for the things he was brainwashed into believing he needed. A flood of consciousness spilled over Prozak Morris and Chikies The Dog and they vowed to the all the PZMsW’s to never forget and from here on out stay indivisibly true to the message that was brought to them that faithful night they first found PZMsW51986. The aliens wished them well, and granted them some gifts of noys, and sownd to bring with them back to earth. As the low end rumble, rhythmic servo motors, sputtering engine, syncopated flashing lights, and hodgepodge of bleeps bloops wooshes and blips radiated from The One Man One Dog Enterprise our heros Prozak Morris and Chkies The Dog set a course back to their home planet Earth and swiftly faded into the dark distance of space with a newly re-instilled vision of PZMsW51986’s message that will continue to live on now and forevermore. They call it everything, the humans call it love. instrumental compilations, its only natural Prozak Morris return to the underground with this project and with PT!